), many of their outfits actually have science woven into them. 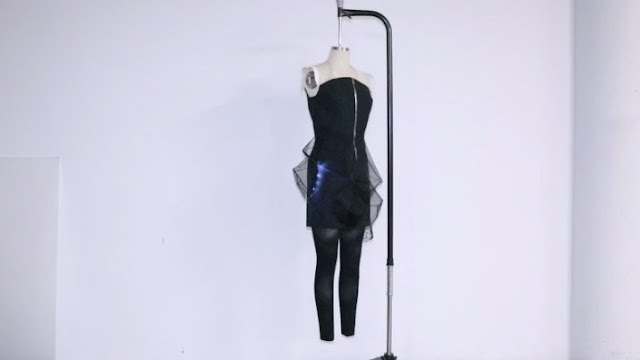 At Wearable Media's recent talk at Maker Faire 2017, Co-Founder and CTO Jingwen Zhu spoke about the company's origins and the future of garment design. Here are some of the coolest pieces of clothing that have come out of the company so far. asteroids and deep space, in effect, turning the human form into a celestial sensing body. The garment emits electrical current throughout the sensor points in the textile, intimately vibrating against our skin, letting our body sense the range, frequency and distance of NEAs. Ceres also illuminates alongside the garment, identifying the frequency and distance through the velocity and brightness of the embedded LEDs. The embedded microcontroller in Ceres is programmed to work with NASA's Asteroid Neo-Ws RESTful API, which collects and catalogs real time data sets of near-Earth asteroids surrounding our orbit. Project Reefstone is a data-generative garment that visualizes the dramatic change of global temperature in the last 40 years. Each piece of fabric panel is laser cutted according to the global land-ocean temperature index data provided by NASA. The form resembles the bleached coral reefs, and are decaying due to the rise of global temperature. There is beauty in its form and decay, but it also illuminates the dangers of a rapidly declining ecosystem. We want to raise awareness about the impact of global warming and tell its story through a high concept and data-driven garment. If you're looking for the full story behind the company, you can listen to Jingwen herself talk about how they got started below!